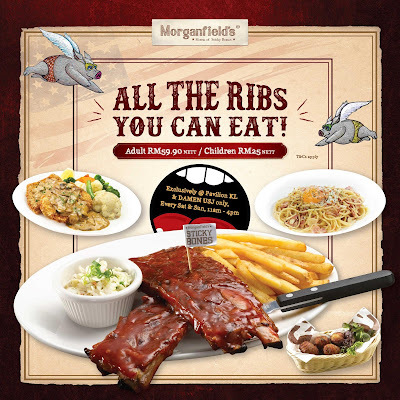 At Morganfield's Pavilion & Morganfield's Damen Mall , you can now take your pick and indulge in an eat-all-you-can a la carte style of feast! **This promo is exclusively available at Morganfield's Pavilion & Morganfield's Damen on weekends from 11am - 4pm only. Buffet is a la carte style & food items available are from selected menu only. Children price of RM25 nett is defined as not more than 12 years old or 120cm in height. Children below 3 years old is free. Sharing of table with non a la carte buffet diners is not allowed. Please do not waste precious food, wastage will be charged at RM10 per 100gm. Not applicable with any other promotions & discounts. Valid for dine in at KL Pavilion & DAMEN USJ only on Saturdays & Sundays from 11AM - 4PM.